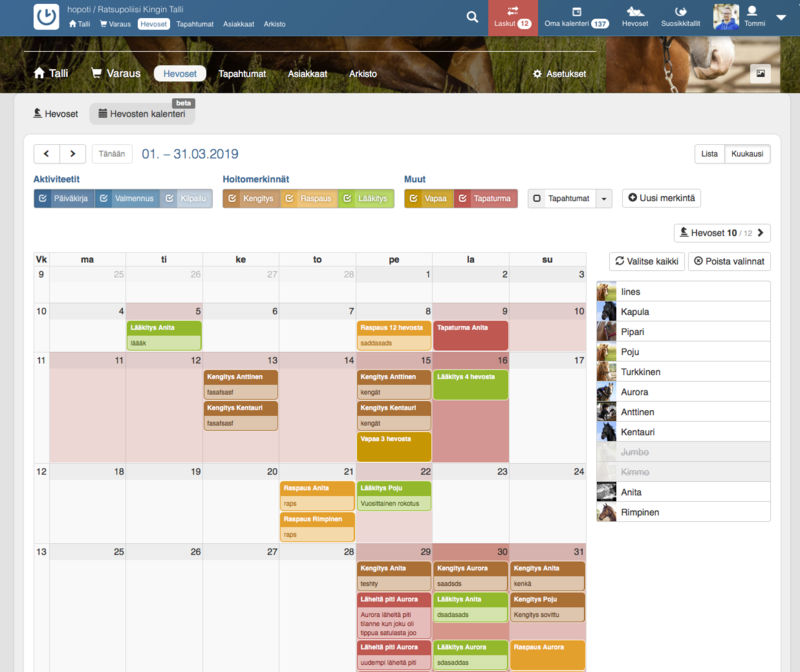 Hopoti Horsecare is a handy tool for companies and all other horse owners for health monitoring, medical information maintenance, and care and exercise diaries. Featuring Hopoti-stables for their own horses and private horses at the same stables, the property is free - other horse owners can take advantage of the service at an affordable monthly fee. Under the Horses page in your profile, you'll find the Add Horses button to start adding your own horses. Just fill in the basic information about your horse and your horse's own Hopoti page is done, and completely free by the way! Under the Horses page of your profile, you will also find a paid Horsecare page to start using the Horsecare features. On the Business Account Horses page, you can create horses through the Add Horse button. Below the same Horses page you will also find a Horsecare page for access to all the horses calendars and Horsecare information. Other information, such as description, dimensions, times, or even if the horse is disabled, can also be added. You can browse the entries in the Horsecare Calendar, where you can select the horses and the types of entries you want. You can create new entries by tapping the New entry button or the desired day in the calendar. You can view and edit existing entries by tapping the entry to open more information about the entry. It is advisable to mark the entries for all the activities and actions that have been done, but it is also advisable to plan for the future, for example, shoeings, so that the entries act as automatic reminders. You can view the horse's information by tapping the horse's Horse Window button on the Horses page. The information opens to your own view, where you can see at a glance all the basic knowledge, notes, care instructions and the latest Horsecare entries. The view is slightly different for Users and Business Accounts. 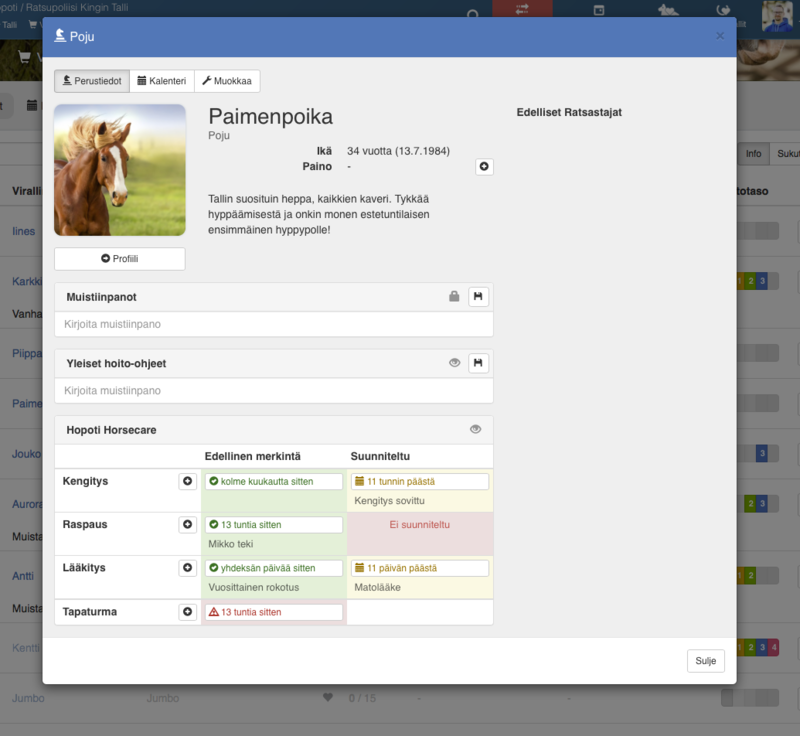 Permissions, so that Horsecare data can be shared between users and stables in the way they want. Requests for the approval of private horses in the Hopoti Stables are also possible at the same time. Payments, at the moment Horsecare feature is available free of charge without completing payment information – in the future, after a month's trial, you will need to enter your payment information to continue using the service. We develop the feature based on the feedback we have received, so please send us your ideas and questions via chat or email to support@hopoti.com – thank you!